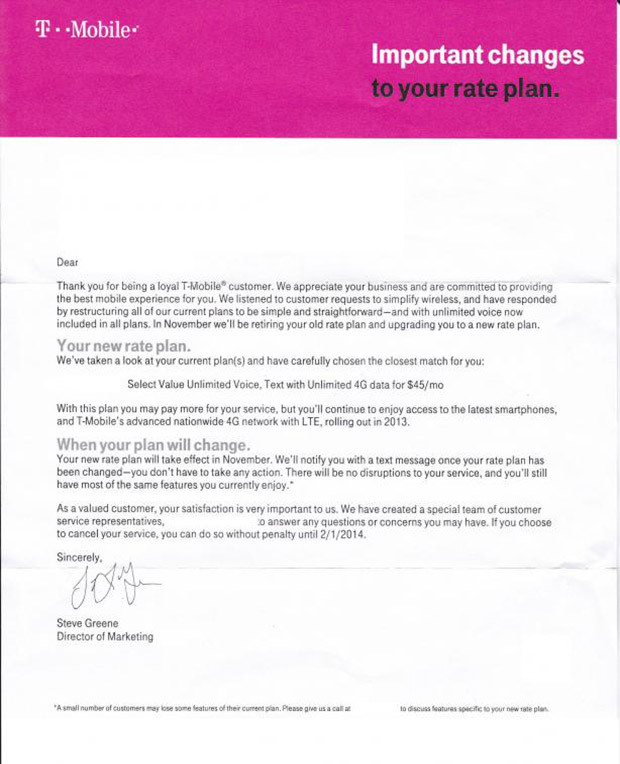 If you currently own a grandfathered unlimited data plan from T-Mobile, prepare to kiss it goodbye. Come November, T-Mobile will begin ushering customers off of those legacy plans and onto new plans with unlimited voice, text, and data. Specific details on new plan options are receiving mixed reports at this time, however, a Howard Forums member who received a letter detailing his plan’s change. He was offered a plan at $45 per month, with everything set to unlimited (though the amount of full speed 4G remains up in the air). The current lowest level Simple Choice plan runs $50 for unlimited everything, with only 500MB of data at full speeds. Maintaining thousands of rate plans is the norm in the industry, but we think it creates unnecessary complexity. Simple is better, which is why we’re reducing the number of older plans in our systems. We’re giving customers on these plans the opportunity to choose a plan that best meets their needs. For the vast majority, their plan will provide similar or better features at a comparable price. While that’s semi-unfortunate news for long-time T-Mobile customers who loved their old plans, the Simple Choice plans that T-Mo currently offers are some of the best and cheapest in the business. Should Verizon decide to pull a similar move with its grandfathered unlimited data customers, the news won’t be so lukewarmly received. And on that note, how long before Verizon pulls something similar? Every wireless carrier in the industry seems to want to follow T-Mobile’s lead these days. Dark days could be ahead. Cheers Scott, Tony, and Justin!